and gamification, STEAM, and so much more! "Where Teaching, Learning, and Technology Converge"
This three day event is only $295* for all attendees. Breakfast and lunch each day are included in registration fee. If you are not already an OLC Member, you will also receive a free, three-month OLC professional membership as a part of your registration so you can get to know OLC and our community better! Details will be emailed post-conference. *A $50 fee will be charged for all cancelled registrations. Refund requests must be made in writing to Online Learning Consortium. Cancellation by April 26 (up to 1 month out): Refund of payment minus the cancellation fee(s). Cancellation between April 27 and May 24: 50% refund will be issued less a $50 administrative/cancellation fee for registrations. There will be no refunds within 1 week of event date (cancellations must be received by May 24, 2017). If you are not able to attend, a substitute may attend in your place. The name, title, and email address of the substitute must be emailed to conference@onlinelearning-c.org. If you do not attend the program and do not submit a written refund request, Online Learning Consortium will retain all fees. IF you have not paid in advance but have cancelled your registration, you are responsible for the cancellation fee and will be billed. OLC is not responsible for any change / cancellation charges assessed by airlines, travel agents, hotels or other similar vendors. Email all cancellation requests/substitutions/ registration questions to conference@onlinelearning-c.org. How do people learn? That question is central to education and over the past 75 years, cognitive psychologist have identified many processes that greatly enhance learning outcomes. Starting from a basic definition of what constitutes learning, techniques to incorporate these findings from cognitive psychology in the students’ educational experience will be surveyed. The overview will be followed by a short examination of the initial attempts to use the data generated by online learning technologies such as learning management systems and adaptive learning programs to better understand the learning process. Dr. Elliot King is professor and chair of the Department of Communication at Loyola University Maryland, where he is the founder and supervisor of an online M.A. program in Emerging Media. He has written about the impact of new communication technology for 30 years and is the author of seven books including Best Practices in Online Program Development (Routledge, 2014) and Planning Strategically for Online Education (Routledge, forthcoming). He has also written extensively about the impact of the Internet on journalism, including Free for All: The Internet’s Transformation of Journalism (Northwestern University Press 2010) which was the first history of the Internet and the news media and The Online Journalist (Harcourt Brace, 1995) which was one of the first books to explain how journalists could use the Internet for reporting. Dr. King began teaching online in 1999, when he was a member of the faculty of a Pan Asian Master’s Degree program in journalism sponsored by the Ateneo de Manila University, the premier private university in The Philippines. In that program, he taught students in six Asian countries including The Philippines, Thailand, Viet Nam, Nepal and Bengla Desh. He has been teaching online ever since and launched the online M.A. program at Loyola in 2013. The program currently has 100 students. A recipient of a Digital Humanities grant from the National Endowment of the Humanities, he is the founder of the Media History Exchange, a social network and archive for media historians and executive chair of the Joint Journalism and Communication History Conference, an annual interdisciplinary conference for people studying media and communication history. Prior to entering the academic world, Dr. King edited Scientific Computing and Automation, a professional journal that looked at the ways new computer technology was changing scientific research and was a co-founder of Unisphere Research, which conducted research into Information Technology issues for companies such as IBM. Over the years, he has written hundreds of articles for popular, professional and academic journals. He received an M.S. in Journalism from Columbia University and a Ph.D. in Media Sociology from the University of California, San Diego. He blogs at University5dot0.com and you can follow him on Twitter @elliotkingphd. Libraries and Librarians on the User-Centered Bleeding Edge. As institutions with a history stretching further back than university or public school systems, many see libraries as static entities. The Library of Alexandria collected, held, and made available the knowledge of the day, and so too do libraries now. However, libraries are increasingly involved in all manner of trends. Since libraries are generally not required to follow rigid curricula, in most academic institutions they have the freedom to explore new tools and technology as they become available. In this session, we will explore the work librarians and libraries are doing and how it can relate to larger educational goals. Libraries are leading the charge for Open Access, Makerspaces, Institutional Repositories, Alt-Metrics, and more, while still continuing the emphasis on user-centered service both in person and via remote access, which means everyone can learn something from the library. Teresa Slobuski is the liaison librarian for Teacher Education and Special Education at San Josè State University. She also serves as the Research Services Coordinator. In this role, she oversees the Research Department and liaisons with other library departments to provide excellent public service to SJSU students, staff, and faculty. A breathtakingly short hype cycle prematurely sounded the death knell for massive open online courses (MOOCs) while overlooking the value that they bring to the table: massive data that describe the convergence of teaching, learning, and technology at scale. The University of Colorado has been a Coursera partner since 2013 and, in the course of developing dozens of courses, specializations, and even for-credit certificates on the platform, has gleaned principles of learning design from the nearly 2 million learners who have signed up for its MOOCs. Analysis of data and Coursera’s own A/B testing has given hints about how to best retain and assess the learning of the largely “volunteer” learners in MOOCs. Many of these lessons in learning design at scale can and rightly should be applied to the design of face-to-face, hybrid, and “traditional” online courses. They also bear a striking resemblance to the basics of learning design: knowing the learning audience, knowing and contextualizing what they need to learn (and how we can best determine whether or not they’ve learned it), providing community and expert feedback and coaching. Deborah Keyek-Franssen, Ph.D. and Associate Vice President for Digital Education and Engagement at the University of Colorado System Office, is a creative educator and thought leader with over two decades of experience in IT and higher education. She began her career at the University of Colorado in 1998, where she served as director of academic technology; oversaw strategy and research in the use, implementation, and evaluation of educational technologies; and managed a team of consultants and technologists. Currently, Deborah works across the CU System in the areas of teaching and learning with technology, online education, access to higher education, and student success. She has been instrumental in furthering CU campuses’ implementation of digital and online education solutions, including MOOCs. She serves as the director of the Colorado Learning and Teaching with Technology (COLTT) Conference and oversees state authorization compliance. She is an inaugural member of the Coursera Advisory Council, serves as faculty for the EDUCAUSE Management Institute, and sits on the steering committee for the National Association for System Heads’ (NASH) Taking Student Success to Scale initiative. She has supported the National Center for Women & IT (NCWIT) for more than a decade and participated in research and program development to increase the number of girls, women, and underrepresented minorities in IT education and work. Deborah is a graduate of Dartmouth College and completed her Ph.D. in German Literature at the University of Michigan, where she also earned a master’s degree in Higher Education Administration from the Center for the Study of Higher and Postsecondary Education and a graduate certificate in Women’s Studies. Significant changes in digital education have brought about an opportunity for teaching, learning and technology to converge. Looking at the learning sciences, the 21st century library and the scalability of learning, we can identify best practices and opportunities to continue to create an effective learning environment for student. The day’s final session brings together the thoughts and conclusions generated from the OLC Collaborate with Emerging Learning Design discussions to formulate a regional response to the changing educational environment. Topics gathered by OLC facilitators and session archivists during breakout sessions along with those posted online by participants during the day will be used to guide this interactive final session. Led by Jennifer Mathes from OLC, each of the day’s keynote speakers will have the opportunity to address the collectively generated questions and topics and place them in the context of the broader changes occurring in higher education. The OLC Collaborate with Emerging Learning Design response will continue the contribution to a national discussion as the OLC Collaborate sessions continue across the country. Jennifer provides leadership in researching, scoping, managing, and evaluating key projects, programs, and customized solutions that are aligned with OLC’s Advisory Services domestically and internationally. Dr. Mathes has nearly 20 years of experience in both public and private for-profit higher education where she has supported online learning initiatives since she taught her first online course in 1997. She has been instrumental in working with start-up online initiatives as well as leading growth in institutions with an existing online program. She holds a Doctor of Philosophy degree in Education from the University of Illinois at Urbana-Champaign where she wrote her dissertation on “Predictors for Student Success in Online Education.” She also has earned a Master of Science degree in Business Education and a Bachelor of Science degree in Mass Communications from Illinois State University. When teaching, learning, and technology converge, we find the potential for an inclusive learning experience that is both engaging and connected to curricular needs, without being dated. 21st century technologies provide a common space to explore and experience in an engaging and/or collaborative educational experience grounded in knowledge, strong pedagogy and learning theory. Participate in the regional OLC Collaborate with Emerging Learning Design (ELD) discussion on the “Where Teaching, Learning, and Technology Converge” and share in an open dialogue with other colleagues from around the region. During the conference, the Keynote speaker will offer insightful views on the question of how people learn and what works best by examining the past until now. General session speakers will focus on libraries, online course value, and learning sciences that all culminate with how teaching, learning, and technology have impacted these areas, followed by facilitator-led discussions to allow participants to delve into each topic in greater detail. Concurrent, Workshop, and SPARKS! presentations will focus on a wide diversity of topics, organized by keyword, with useful takeaway information. Cohort meeting will provide an informal learning environment in which members can collaborate, discuss, and share ideas pertaining to current topics for the group. There will also be three special events, including the Campus Tour and Site Visits, a Game Night, and the ELD After Party. Collaborate General Sessions are 30 minutes long, followed by 45 minute Collaborate Breakout Sessions. Concurrent sessions are 60 minutes long; and workshops are 90 minutes in length. All sessions are held at Montclair State University and are in Eastern Time (ET). Keynote speakers will offer insightful views of the changing university through short, focused 30-minute presentations. This will bring together how the use of technologies, the dictate of economic realities, increasing regulatory oversight, the need for constant innovation, and new societal expectations of what colleges can and should be are bringing change to online education. General Session presentations will be followed by 45-minute facilitator-led discussions to allow participants to delve into each topic in greater detail. Session archivists will document the discussions throughout the day, culminating in a collaborate regional response to the changing university. A place for people to go to learn more about their interest area. While the workshops are based on keywords that cater to different interests, you do not have to have prior knowledge of the subject to attend. Workshops stand out from other sessions due to their length, as they have a much longer format than the others. Also, workshops usually contain some type of hands on component that really let the attendees interact with what they are interested in. Workshops are a place that encourage growth as well as foster new ideas and relationships in other categories that can be beneficial to any interest area. Cohort Groups provide an informal learning environment in which members can collaborate, discuss, and share ideas pertaining to current topics for the group. The meeting allows brainstorming opportunities as well as informative peer-to-peer collaborative thinking. The open discussion setting allows individuals who share a common interest to engage with one another in lively discussion regarding a key topic. Existing Cohort Groups include: Faculty, Instructional Design, and Librarian. Concurrent sessions are presentations about a variety of topics that occur at the same time. This gives those attending the conference a chance to pick what type of session they want to go to based on interest and personalize their experience. Presentations with similar focuses or keywords are typically separated into different sessions so that there is something interesting for everyone during each session block. Each attendee’s conference experience will be unique because of the choices they make during concurrent sessions. Sparks is a fun and non-traditional way of sharing your expertise with those around you. Each speaker will get 5 minutes to showcase their projects or findings to the audience. At the 5 minute mark, a timer will sound and quickly transition to the next presenter. Because of the fast-paced style, Sparks sessions are often lively and energetic, and focus on keywords. The Sparks sessions allow creativity with your own presentation in ways such as speeches, videos, or visual aids. The session is informal and allows the audience to get acquainted with new ideas or topics very quickly. Wednesday after the Collaborate Wrap Up, take this opportunity to stretch your legs with a health walk around campus. One lap is about 1/4 of a mile and has two wonderful spots to take pictures. Emerging Learning Design is pleased to host its first Game Night. Join us Wednesday at 4:30pm, or select the Campus Tour and Site Visit route that concludes at the Game Night. Come and play your favorite games, or learn new ones. We’ll have favorite board games, educational games, card games, and video games. Come to play, watch others play, or hang out and have a good time. This event is free and open to all conference attendees. Please be sure to RSVP for each of these optional activities during the registration process. Joining us for OLC Collaborate with Emerging Learning Design? Come directly to Montclair State University, University Hall / ADP Center. Staying for all three days? When teaching, learning, and technology converge we find the potential for an inclusive learning experience that is both engaging and connected to curricular needs, without being dated. 21st century technologies provide a common space to explore and experience in an engaging and/or collaborative educational experience grounded in knowledge, strong pedagogy and learning theory. Consider the times of convergence you’ve experienced – What made it effective and where were your challenges? What worked, and what needed refining? What were your ingenious, light-bulb moments and what were the lead balloons? Share your stories and your insight as we discuss where teaching, learning, and technology converge. 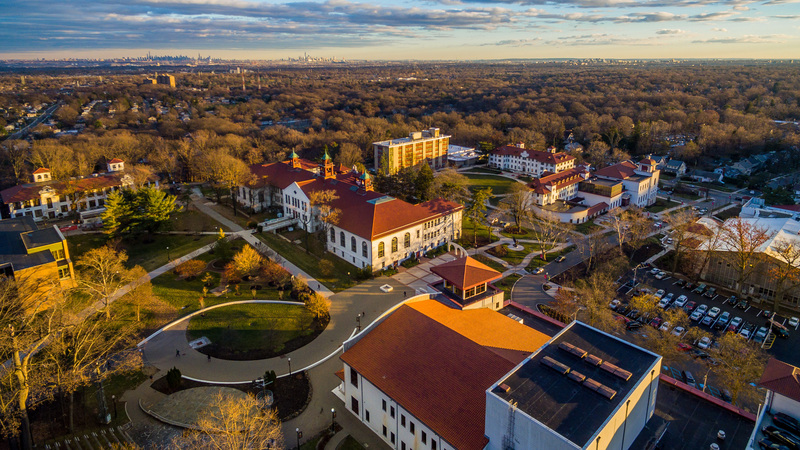 Montclair State University is committed to serving the educational needs of New Jersey with programs characterized by academic rigor and currency in the development of knowledge and its applications. The University will offer a comprehensive range of baccalaureate, master’s, and certificate programs and a focused portfolio of doctoral programs that are closely aligned with the University’s academic strengths and the needs of the state.